Part of my internship with WATER this summer is gaining on-the-ground insight into how faith and politics intersect. I couldn’t ask for a better case study than the Hobby Lobby case. However, I can no longer be silent, as fundamentalism buttressed by vague renderings of the “Word of God” threatens to send rights for women back into the Dark Ages. I expected jeering and shoving on the marble steps, but in fact was surprised at the congenial tone of both camps, and how easy it was to fold myself into the frontline. 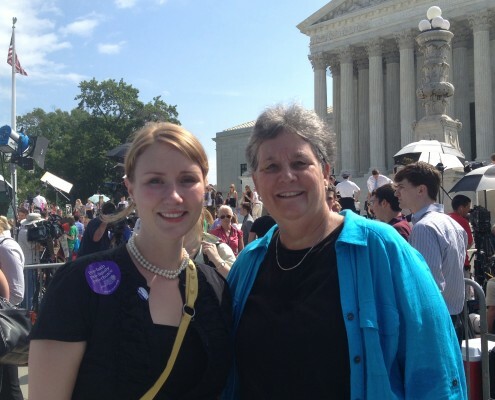 Almost as soon as I stepped onto the sidewalk, I was handed a purple sign from a NARAL rep. While there was an attitude of buoyancy, it was clear from the crowd’s defensive chanting and posturing that the outcome loomed bleak. I pushed through about five rows of people to find myself standing directly next to Rev. Harry Knox, head of Religious Coalition for Reproductive Choice. We greeted warmly, having met recently for a Q&A session set up by Mary. Hearing about Harry’s work had been a truly inspiring encounter, and I was pleased to find he remembered me. Joined by several members of his staff, Rev. Knox was donning a collar and rainbow stole despite the blazing heat. I would see why after the decision – the collar is an effective way to get media coverage for the RCRC cause. It was also great to see folks turned up from many similar causes in solidarity with this issue, including LGBTIQ activists handing out rainbow flags. Like Justice Ginsburg, we all realize this decision has huge repercussions not only for women, but for any minority group that happens to raise extremist religious objections in the workplace. 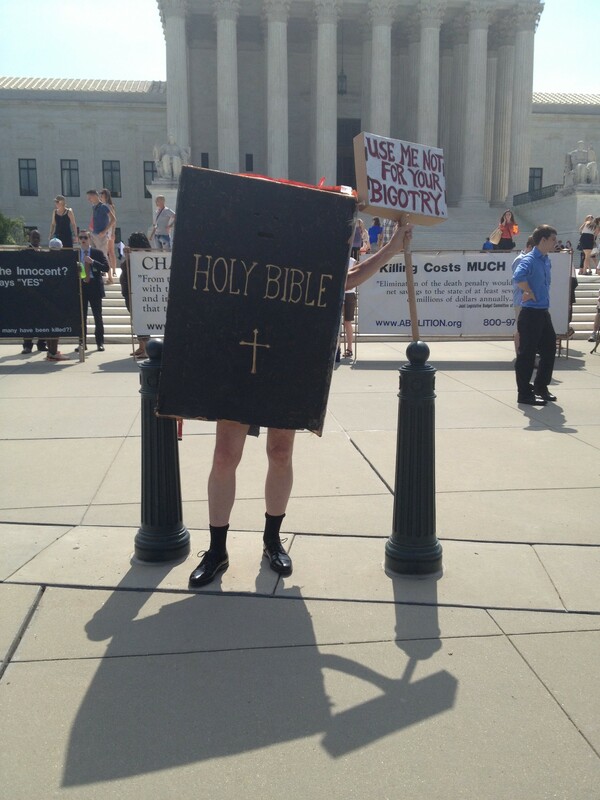 My favorite message from the Pro Choice side was a silent demonstrator dressed up like a giant Bible, holding a sign that said, “Use Me Not for Your Bigotry.” This strikes me as a profound theological message. Out of great respect for Biblical scholarship and study, this simple sentence recognizes the dangers of unaccountable Biblical literalism – ideology that can harbor dangerous structures of oppression. As a divinity student, I marvel that anyone can use canonical texts to force a singular vision of morality in a pluralistic world. Isn’t equality and freedom the center of the gospel message? It is not what we’re freed from, but freed for – a life lived in fullness. A life that promotes flourishing for all that breathes. This is feminist theology at work. This occurs to me as disjointed, problematic, non-sense. The Right might want less government intervention, and they think they are fighting for religious freedom, but they don’t realize what this decision represents. This decision means the leaders of public companies have greater religious freedom than the people who work for them. This means the personal morality of the CEO trumps the convictions of their employees. This means CEOs can legally determine what others do or don’t do with their bodies. This has solidified corporate power to an ominous degree. If Hobby Lobby wants to be a religious organization, then they should put up a sign that says “Christian scrapbooking for Christian scrapbookers” and only hire people who affirm their theology. However, if they want to benefit from a public workforce, public profits, and public services like roads and schools, while simultaneously restricting the bodies of their staff on religious grounds, then the company’s actions become fascist and utterly un-American. This is not freedom of religion for all. This is enforcement of religion for the powerful. This case is actually a very simple matter. For religious people who want to ensure actual religious freedoms not only for themselves, but for others – for those who believe in Constitutional liberties, for those who want to stop propagating classist structures of power – there is only one “right” side of this issue. Don’t get me wrong, I am not saying abortion is a happy thing; I am not saying I am anti-life. I would be remiss, given my upbringing, to treat this delicate issue in a simplistic way. What I am saying, as a theological scholar, is the person who should ultimately decide what happens inside a woman’s body is the woman herself, supported by her personal community – NOT the folks paying her salary. Anything less monetizes ethics, and creates a reprehensible code of morality where only some have rights. Thank you to Mary E. Hunt for accompanying me to this event. While the Court decision was disappointing, it was also an incredible lesson in our civil processes and the nuance of religious freedom as wielded in public discourse. Melody Stanford is a WATER summer intern. She holds dual B.A. degrees in Business and Theology from Wheaton College, is a current MDiv student at Boston University School of Theology. She also works as a freelance graphic designer.